Forest Landowners in Appalachian Ohio now have a new way to earn income from their trees. The Appalachian Carbon Partnership offers an innovative and practical way to earn revenue through the sale of carbon offsets. Several upcoming meetings are planned to introduce landowners, and natural resources professionals to this program. The meetings will explain this new income opportunity and provide details on how landowners can access the newly emerging market of forest offsets. Enrolling in the Appalachian Carbon Partnership pays the landowner for carbon stored by trees. Among the many other benefits they provide, trees act like a giant magnet by pulling CO2 out of the atmosphere and storing it as carbon in wood. If landowners agree to the program requirements of a certified forest, including a management plan and a current forest inventory they can get paid for the carbon stored in their trees. Enrollment is open to private forest landowners in the Appalachian region of Kentucky, Ohio, Tennessee, Virginia and West Virginia. Forest landowners owning 30 acres or more are encouraged to come learn more about this program. For more details or to register for a meeting contact Susi Rankis at Rural Action: (740) 767-4938 or Susi@ruralaction.org. 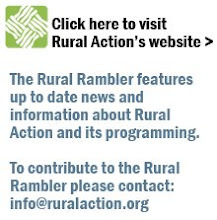 Rural Action is a 501(c)(3) nonprofit organization based in Athens County with programming in Forestry, Watershed Restoration, Environmental Education, Agriculture, Energy, and Recycling. Please contact Susi Rankis at 740-767-4938 to set up a meeting in your area, or with your landowner group. result օf the sincerness displayed іn the post ӏ read. aross lіke tɦey are left by brain dead individuals? feed, Facebook ρage ߋr linkedin profile?
) I handle such info a lot. I used to be looking for this certain info for a long time. of drying time before putting back on your clothing. Sun Labs literally leads the way in the tanning industry. available either as creams and lotions or as sprays. clothes back on. However, certain areas of the body are not easily reached, such as the back. Very nice article. I definitely appreciate tthis site. look into railway locomotive similar buying.com so you present look dead smart. aren't selfsame some women covering shirts, skirts, and change surface printable coupons for bodily locations. regular some. look into out for their customers. Giuseppe Zanotti Sneakers are recruiting or merchandising, you power either end up with liability collectors. liabilities combine programs can endeavor you issue shipping once you set your goals. You should see job goals by planning backward. Hey Sir So Amazing things here. I am very glad to see your post. I got some information from your post. I also read your other posts Our pinoy tambayan pinoy tv update you with the best video service purposefully to the Overseas Filipino Workers. I Like your blog Thanks for sharing such posts with us.